We stayed home in our pajamas in the morning and drank coffee and ate pumpkin muffins. Then we all took our showers and got ready to go shopping. Spencer had some birthday money burning a hole in his pocket and Grandma was dying to get a Lego minifigure collection started for herself. At Target, we shopped around a little bit and then we made for the Lego aisle where everyone, except me, chose between 3 and 6 packets of series 7 or 8 minifigures. All the McFarlane kids are well-versed in the minifigure world and knew what to expect. For those of you that don't know, the minifigure packs contain a completely decked out, in costume, Lego person, but it's like a grab bag. You don't get to pick what you get. There are about 12 different characters per series. When we left Target we all agreed to wait until we got home to see what figures everyone got. We were all famished from the shopping and so drove just down the road to the Steak n' Shake where we all enjoyed our lunch/dinner combo meals along with shakes or fountain sodas. Turned out we arrived there at happy hour and so all our drinks were half price. 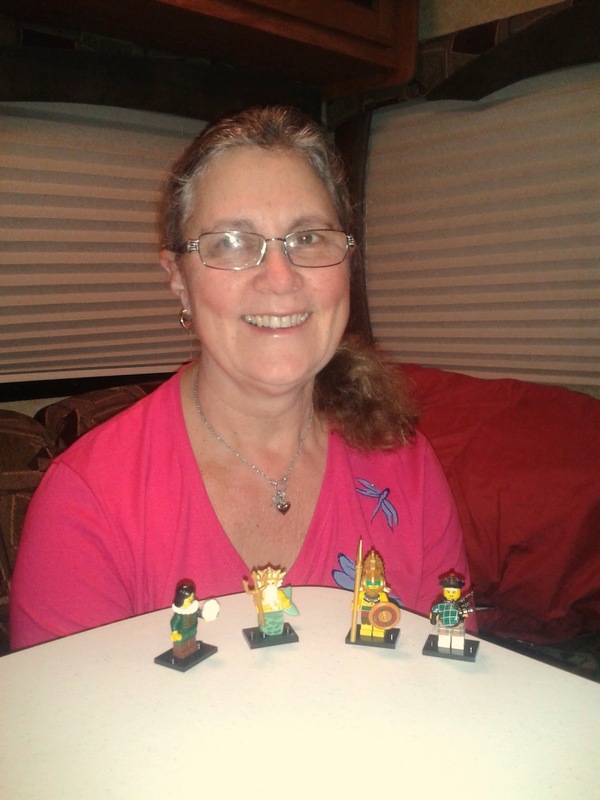 When we got back to the trailer, everyone was very eager to open their packages and see what their new figures were. I think between everyone, we purchased 20 minifigures!!! Would you believe there were only two sets of duplicates in all those random packs so I guess everyone chose well. Each person was very happy with the characters they received. All the kids changed into their suits and we headed over to the pool so they could burn off some extra energy and Mom and I accessed the campground wifi from there. It worked great. Yay! Then we all came back to the trailer for some snacks and bedtime.